Teacher Leaders work with site administrators to support ongoing collaborative planning and professional learning at their sites. 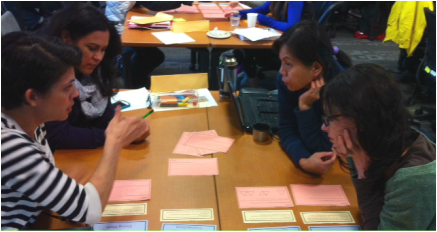 With the support of the SFUSD Math Department, Teacher Leaders facilitate the learning of mathematical concepts in the Core Curriculum units and pedagogical structures that support the Standards for Mathematical Practice. In past years, Teacher Leaders from every K-8 school participated in professional development based on the Learning Strand of their school's choice. Learning Strands have included: Academic Discourse, Formative Assessment, Heterogeneous Instruction, and Collaborative Groupwork. See a description of the Learning Strands here.